We are pleased to announce that the 2019 YAM mission journey will be to Ecuador. Our host will be Sara Flores, General Board Missionary. We are limited to 15 youth participants. We will accept persons on a “first-application and deposit” basis. A priority will be given to first-time YAMs. Names and $250 deposit are due by March 1. The cost of YAM mission journeys are shared by the Youth Ambassador, his or her family, the local church, and the district. Local congregations from the New York Conference of the United Methodist Church are invited to recommend youth to apply. Applications and additional information are available through the NYAC Mission office (tvencuss@nyac.com). The Youth Ambassadors In Mission (YAM) ministry focuses on one main goal; Making Disciples for Christ. This goal is achieve by growing young Christian leaders, developing their faith, teaching them how to love and serve God’s children everywhere in this world, and instilling in them the Wesleyan/Holiness missions spirit of evangelism and social responsibility. The average age of YAM participants is 17 years. For most participants, this trip would be their first time traveling away from home and family to a different country to experience a different culture. The YAM experience therefore offers a critical cross-cultural encounter and fosters a sense of maturity in the faith journey of our young people. About 200 youths have participated in the YAM ministry since its inception in 2005. 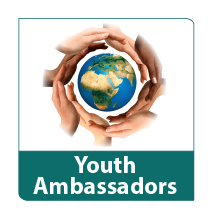 Among the countries that Youth Ambassadors have served are: Antigua, Bolivia, Cambodia, Costa Rica, Ecuador, Ghana, and Haiti. Each year these dedicated teenagers who leave their comfortable homes, familiar environment, friends, and parents, with lots of anxieties, uncertainties, and fears travel to another country to accomplish specific assigned projects. The actually accomplishment is not the construction project they do, it is the sharing of God’s love with others through humanitarian services. It is the lasting relationships they develop among themselves and with the new community. It is the transformation that occurs in the life of the youth through their encounter of Christ in the Other.